You will be required to locate peer reviewed articles for your Developmental Physiology course. Use the tabs to the left to navigate through this guide. For your reports, you will need to incorporate a number of different types of sources. Make sure you understand the difference! Watch this tutorial to learn about the peer-review process. The main mode of communication by professionals in a field; this regular publication provides the venue where researchers share research, perspectives, and other scholarly communication. Published every week, month, or every few months like a normal magazine. A journal that happens to be 'published' online. There is no difference between a journal that is published in print (like a normal magazine) and a journal that is published online. The process by which original research submitted for publication in a journal is reviewed by other experts (peers) in a particular field. Research is checked by these other experts for data quality, methodology, and if the research is a unique contribution to knowledge in a particular field. A journal article that has undergone peer-review. Another way to describe journal articles that provide the actual data collected, how it was collected, data analysis, and conclusions. A scientific article could be a "literature review" summarizing, analyzing, synthesizing other scholars research. When it is part of a research article, the literature review will also discuss how the research that is to be discussed helps to provide further knowledge on the subject. Articles that are entirely literature reviews are especially useful when you don't know much about an topic, because they summarize what is known and not known. Don't spend hours sifting through article results that don't seem relevant. Search for a specific genus/species rather than a broader term. Use AND/OR/NOT to connect your keywords. Databases can be very particular and each one is different. CSUSM has over 150 different databases with different subjects and materials. For BIOL 404, the recommended databases are listed below. If an article is not available via full text, click the "Request this Item" button in the CSUSM Library catalog. The Library will order the article for you. It will take approx. 2-4 days to receive the article electronically. If not button appears, go to the main ILL page and input the information for your source manually. NOTE: All databases can be used off-campus with your student id/password. Start at the CSUSM Library website to access the database or you will not have Get It! at CSUSM links. Contains citation Idexes for Science, Social Sciences, Arts & Humanities, and Book Citations from 2004 to present. Select "Web of Science Core Collection" to conduct cited reference search. A complete collection of bibliographic references covering life science and biomedical research literature published from more than 4,000 journals internationally. Make sure to access Google Scholar through the CSUSM Library website (see Databases tab) in order to link the Get It! At CSUSM button to access full text articles. Start by going to the Databases tab and click on Google Scholar. Once on the main page, we recommend using the Advanced Search, which can be found on the upper left hand corner in the menu. On the Advanced Search menu, you can enter keywords about your topic. With Google Scholar, we recommend being as specific as possible or you will return too many results. Be as specific as possible when describing your topic. Try to include the specific genus/species rather than general terms (ie: sturgeon fish versus organism). 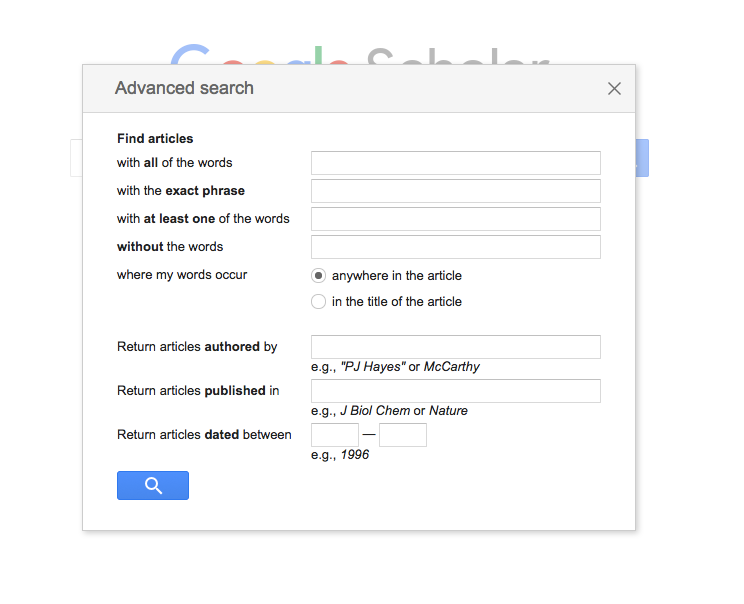 To narrow down the search results, put main keywords and click the “in the title of the article” button in the Advanced Google Scholar menu. Main concepts of an article will likely appear in the title of the article. You can also reduce the number of articles by selecting a specific date range if you are needing articles from a certain time period or articles that are more current. 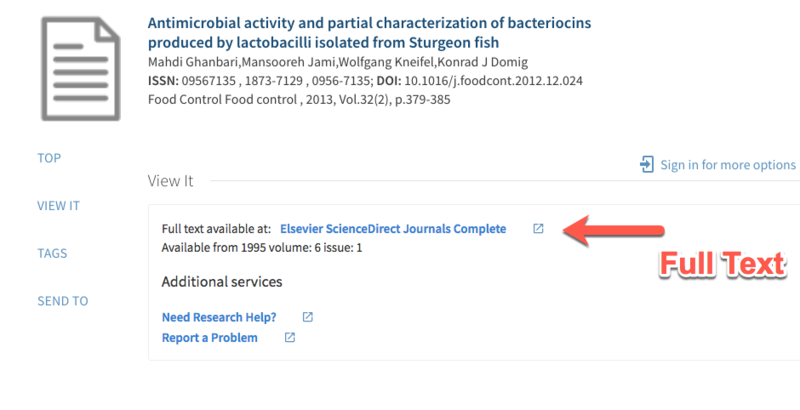 On the search results page, you will be able to see the title of the article, author names, journal information, and the abstract. The abstract is very important for selecting useful articles. The abstract provides a summary of the article. Make sure to read the abstract before reading the full article. Once you find an article that looks promising, you will need to locate the Get It! At CSUSM button. The button is sometimes located in the right margin next to the article. More frequently, the button likes to hide. Click the arrows underneath the article information and it will show the Get It! At CSUSM button. Once you click on the Get It! At CSUSM button, you will be taken to the CSUSM Library catalog page for the article. 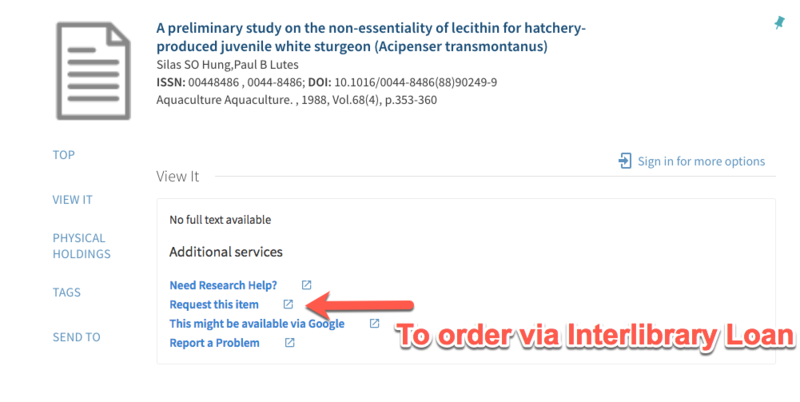 If the article does not have full text available, you can order the article via full text by clicking on the “Request this Item” button. Remember to follow the "15-minute rule" -- if you can't figure something out after 15 minutes, contact me!